Bird-baths are a great way to see some of our smaller birds up close – even though balls of sodden feathers can sometimes be hard to identify! 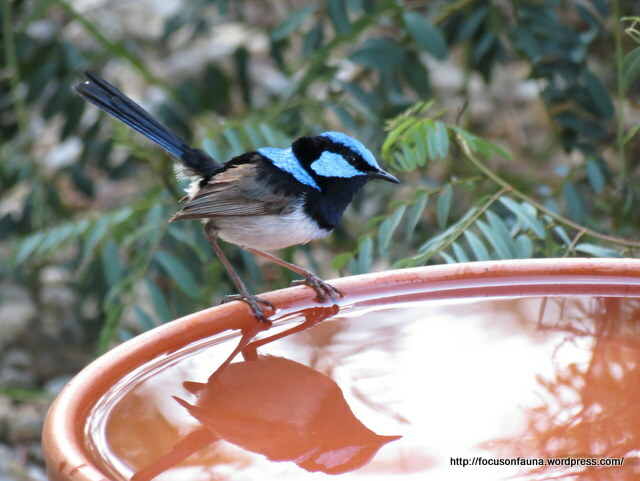 Birds welcome shallow baths placed close to shrubs for protection, but remember, as well as drinking, birds bathe and occasionally poo in the water, so baths need to be cleaned and topped up regularly. For a better look, click on any of the photos below and then scroll through using the side arrows. E. Spinebill – shake that water out of the ears! birds use the birdbath, and a Blue tongue likes to lie in the warmer one on the ground. Terrific collection of photos, and very helpful for id of some of those tricky ones.